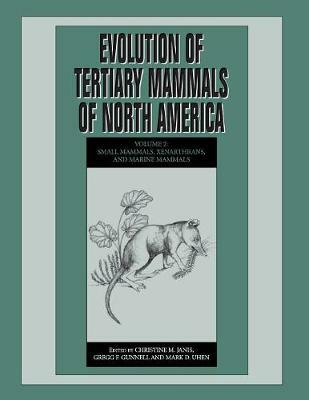 Author(s) Janis, Christine M.; Gunnell, Gregg F.; Uhen, Mark D.
This second volume completes the unique survey of North American Tertiary mammals, and covers all the remaining taxa not contained in Volume 1. It provides a complete listing of mammalian diversity over time and space, and evaluates the effect of biogeography and climatic change on evolutionary patterns and faunal transitions, with the distribution in time and space of each taxon laid out in a standardized format. It contains six summary chapters that integrate systematic and biogeographic information for higher taxa, and provides a detailed account of the patterns of occurrence for different species at hundreds of different fossil localities, with the inclusion of many more localities than were contained in the first volume. With over thirty chapters, each written by leading authorities, and an addendum that updates the occurrence and systematics of all of the groups covered in Volume 1, this will be a valuable reference for paleontologists and zoologists.